Krishna Reddy: Checking Username Availability for Multiple websites. Checking Username Availability for Multiple websites. Well we all need a username to login for almost every site. but getting a cool and catchy username is actually really hard. You sign up with a username that represents your identity, one that suits you. But there is a downside creating an username, your username may be taken by someone else. But there is a service that checks the availability across multiple websites. 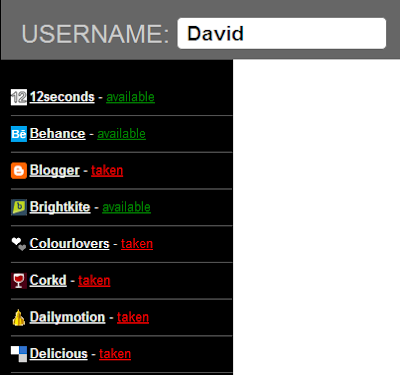 Username Check is a simple website that lets you check username for more than 50 sites. It has got almost every important site listed e.g. Gmail, Technorati, MySpace, Wordpress, YouTube etc. You just have to put in your desired username and the service will check its availability on the fly. The site runs on an application that pings the site with your desired username. The site uses Dojo as it does all the checks using Ajax. Each check takes a couple of seconds using Ajax, so you don’t have to wait for the page to load. Check your username now and see whether it is taken or you still got luck. this service will save you a lot of time and effort!